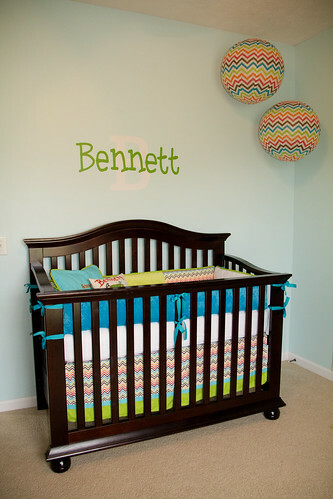 i had so much fun doing bennett's room! 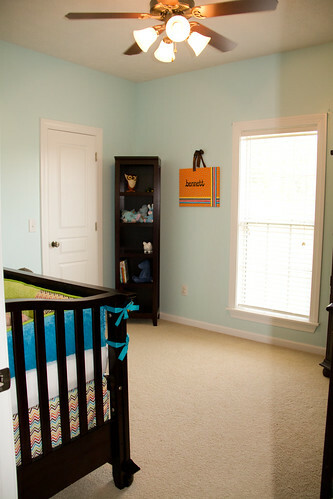 we didn't do anything really for austin's room when she was born, so i was really looking forward to this project! the paper lanterns are by jonathan adler, but they are discontinued. they were bought for my baby shower, and then given to me from the hostesses. wall vinyl is from lucylews. paint is fountain mist by valspar. you may not can tell, but it's a light aqua color. chevron fabric is by ann kelle for robert kaufman, and from the bermuda collection. it can be seen here. 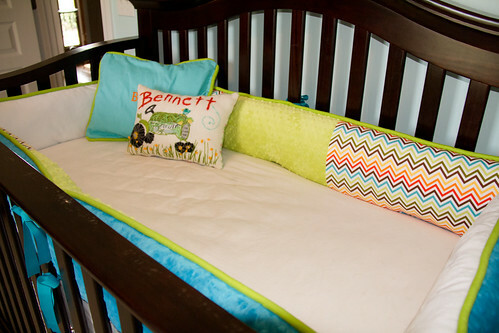 bedding was made by melissa's boutique with coordinating minky fabric. changing table is graco, lauren collection. 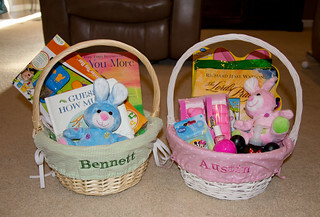 green and brown baskets are from babies r us. spoken for and thomas jefferson prints were done by naptime diaries. keep calm print was done by cj prints. tractor print was done by the smitten image. 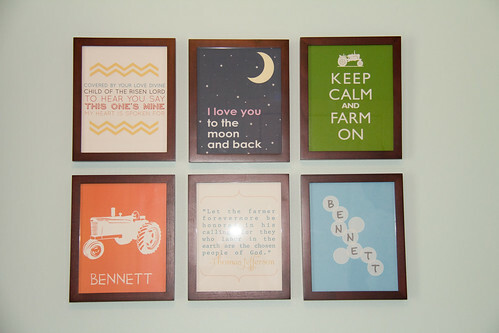 gallery frames are from pottery barn kids. small bookshelf is from target. bennett canvas was made by a friend for the hospital door. i think that covers everything. the only thing that isn't done is the window treatment, and i really can't decide what i want to do with it yet. i've been asked a lot about where i have gotten some things, so i thought i would just add it onto this post. as you are can see, and are about to see, i love shopping etsy. i love helping out ladies that make something out of their home, and i especially love buying if they live in the south. i search for what i want, and then compare prices. i also read reviews left for the sellers from other buyers. it is sort of a gamble, because i have been disappointed in a few things, and i have even gotten cheated out of a purchase before. i had to report it, and the seller is no longer on etsy. things like that happen, you just have to be careful, and go on recommendation a lot. most everyone that i have bought from has been great to work with, and willing to custom make anything that i wanted. some things i found on my own, and some i found through friends. 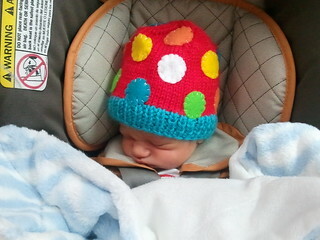 polka dot and tractor hats are from nini's handmades. 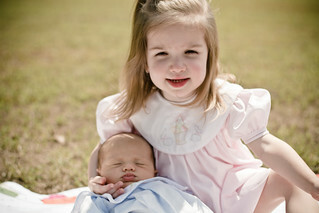 austin's big sis outfit is from the uptown baby. their easter outfits came from the best dressed child. i love shopping this site! you can get great deals on things that are marked down. they have a ton of clothes and brands to choose from, and they make it easy to shop matching bro/sis outfits! 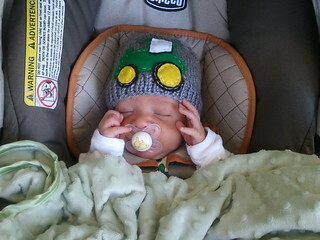 I absolutely love the tractor pillow. I've favorited that Etsy seller! 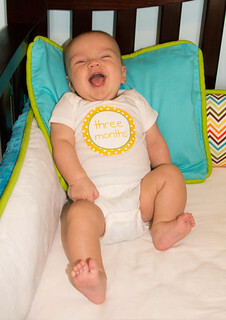 What a wonderful space and sweet babies! 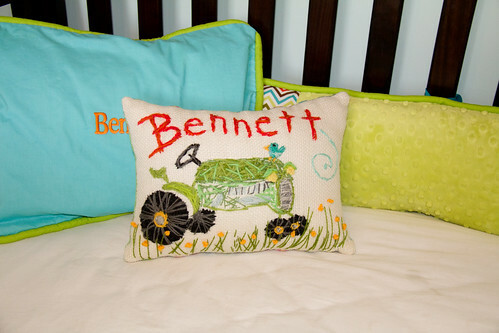 Love the chevron bedding and the tractor pillow. Great job!! 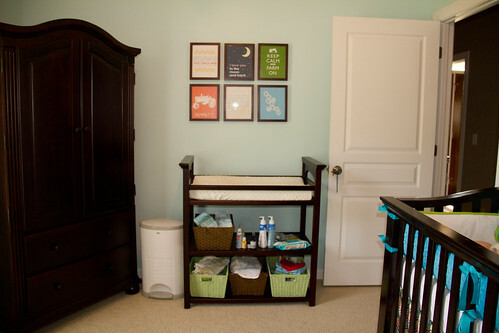 I really like the brightly coloured chevron pattern and the prints above the change table.